Recognition is critical to sustained success! Do you know a new special education administrator who routinely "stick their neck out" for teachers and students? CASE has a new award just for you! It is called the "G"AWARD for Rising Special Education Administrators and was instituted for a member of CASE who is early in her/his career as an administrator. This individual may be nominated within their first 3 years of administrating special education programs/services and the award will be accompanied by a night on the town in their home area (limo, dinner, movie, child care, etc.) up to a $500 value. This award is acknowledgement for the administrator for sticking his/her neck out to better support their teachers to enable them to make a difference in the lives of the students they serve. This award will continue as long as the benefactor continues to provide the monetary award. Click here for more information. Still haven’t registered for the 25th Annual CASE Fall Conference? Well, there is still time! The room block is filling up but there are still rooms available. Professional Development Chair, Will Gordillo has put together an amazing program for our CASE members for the 25th Annual CASE fall conference! Our three keynotes will definitely inspire you but they also will provide you with a wealth of practical tools you can use in your everyday work ASAP. Drs. Stevan Kukic, Randy Sprick, and Frances Stetson will totally blow you away with the quality of their presentations! I have heard each of these 3 professionals on many occasions and I have always left with new ideas, new tools and a feeling that the job I do is important and necessary! The 30+ breakout sessions are also full of practical, evidenced based information. Click here for a list of the breakout sessions. If you want to learn what's new, connect with your colleagues from around the U.S. and Canada, and experience some quality professional learning that is both inspirational and content laden, then join us in San Antonio Nov. 13-15! Registration is up at www.casecec.org. A Call To Action on making Comments on the ISLLC Leadership Standards Refresh Project. This is a very quick turnaround and we apologize for this but we do know some of you will want to make "a statement" on this very important issue. You have two ways to make an impact but you have to hurry. Click here to complete the survey on your own by October. It has come to our attention that higher educational faculty in Educational Administration have been asked to provide feedback on the revision of national standards for educational leadership preparation programs (Interstate School Leaders Licensure Consortium Leadership Standards Refresh Project). These preparation standards are used by national, regional and state accreditation and review bodies to provide guidance for the development, review, revision, and, in some cases, the closure of preparation programs. Leadership preparation programs have been found to be lacking in providing adequate & appropriate content relevant to special education law, policies, and procedures to future school and district leaders. CASE would like to weigh in on this shortcoming & provide a solid voice & response to help change the current gap that exists in leadership preparation programs. Click here to read the "refreshed" standards. Speaking of issues. What are other issues you are facing this year that you need more information on? Thank you to those of you who took the CASE research committee survey last week, but for those of you who meant to but haven't, please take a moment and let us hear from you what we need to be digging deeper on for your benefit! Click here to take the quick survey! Did you get your CEC Ballot? ... CEC's membership-wide election for the 2015 Board of Directors opened last Monday, Sept. 29. CEC leadership must represent the beliefs and values of its members — and you have a voice in electing CEC's future leaders. Vote for YOUR 2015 Board of Directors during the membership-wide election period from Sept. 29 - Oct. 27. Did you take the POLL last week? 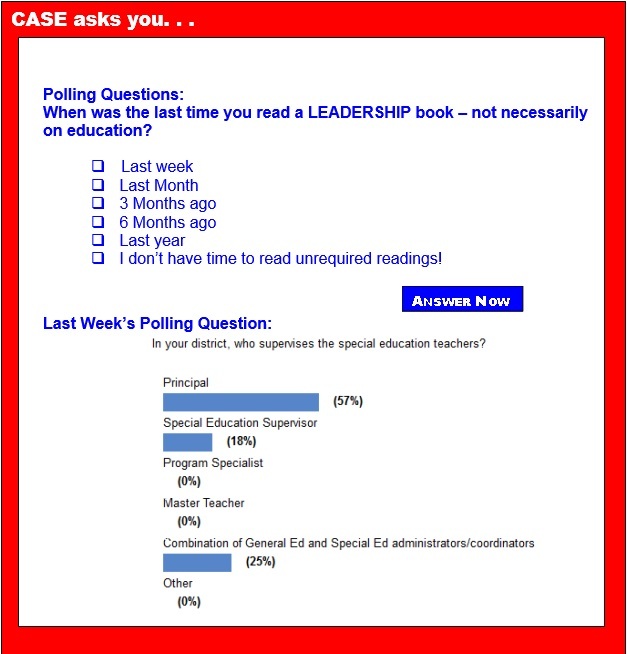 Last week's poll asked who supervises Special Education teachers in your districts. Almost 60 percent of you said it was the principal! Are you reading the continuing series What All Principals Should Know About Special Education in the CASE quarterly Newsletter? If you are a member of CASE, you should have gotten your electronic copy of the Fall newsletter (Vol 56 No. 1) back on Sept. 19 or you can go to the CASE Members Only section on the CASE website and down load the back issues. Dr. David Bateman is the author of this series and it will eventually be our CASE Lucky 21 #7! But, it is also based on his A Principal's Guide to Special Education, Third Edition and it is now available. A Principal's Guide to Special Education has provided guidance to school administrators seeking to meet the needs of students with disabilities. The third edition of this invaluable reference, incorporating the perspectives of both teachers and principals, addresses such current issues as teacher accountability and evaluation, instructional leadership, collaborative teaching and learning communities, discipline procedures for students with disabilities and responding to students' special education needs within a standards-based environment. Get your copy today! Enter code PRCASE at checkout. Leading by convening is an evidence based strategy that moves away from traditional expected behavior for interacting in collaborative practice. The framework will provide strategies to help stakeholder engagement become more comprehensive, holistic, result in long term sustainability and establish a foundation for authentic engagement in supporting improved student achievement. Participants will be provided with resources, tools, information and skills to assist them in understanding and implementing collaborative partnerships that build connections and foster authentic engagement through leading by convening. The Council of Chief State School Officers is seeking feedback from the public on draft standards for education leaders that aim to ensure district and school leaders are able to improve student achievement and meet new, higher expectations. The standards detail the leadership skills and knowledge effective district and school leaders need in order to influence teaching and student learning. Attention-deficit/hyperactivity disorder can harm a child's academic performance and social skills as early as the second grade, a new Australian study contends. Children between 6 and 8 years old who were tested and scored high for ADHD symptoms were more likely to get lower grades in elementary school and have trouble fitting in with other kids, compared with children without ADHD, the study authors reported. Kids with ADHD also were more likely to have other mental health or developmental disorders, including anxiety, depression and autism, according to the study. For parents of children struggling with mental illnesses or learning disabilities, the return to school can be cause for panic. Parents of children with special needs frequently find that standard classrooms aren't equipped to meet those needs. This is where parents come in. It's your job to be a strong advocate for your child's rights, and understanding the basics of the various laws that protect children with special needs is a prerequisite to being a strong advocate for your child. Schools don't always do a good job of educating parents about their children's rights, and a few schools may even actively ignore the law. Knowledge is power, and if you are the parent of a special needs child, you need to know that your child is entitled to a quality education and reasonable disability accommodations. For many, the word dyslexia represents painful struggles with reading and speech that impact their self-confidence — 20 percent of school-aged children and over 40 million adults in the U.S. are dyslexic. Dyslexics are often very intelligent and can learn successfully with appropriate teaching methods, but early diagnosis and intervention are critical. UC San Francisco researchers in the Dyslexia Program aim to predict whether children will develop dyslexia before they show signs of reading and speech problems, so early intervention can improve their quality of life. A new study finds that at least 60 minutes of physical activity after school every day is not only beneficial for children's physical health, but it may also improve their cognitive functioning. The research team, led by Prof. Charles Hillman of the University of Illinois at Urbana-Champaign, publish their findings in the journal Pediatrics. The U.S. Department of Health and Human Services recommend that children and adolescents aged 6-17 years engage in at least 60 minutes of physical activity a day. But last year, a survey of high school students found that only 29 percent had met this recommendation within the last 7 days. All students — regardless of race, color, national origin or zip code — deserve a high-quality education that includes resources such as academic and extracurricular programs, strong teaching, technology and instructional materials, and safe school facilities. Fewer special education disputes between parents and school districts are escalating to due process hearings, a new government report finds. The number of due process hearings nationwide declined from over 7,000 during the 2004-2005 school year to 2,262 by the 2011-2012 academic year, according to a review released Wednesday from the Government Accountability Office. The shift was largely due to "steep declines" in New York, Puerto Rico and Washington, D.C. — locations which accounted for over 80 percent of the nation's hearings — the report indicated. School spending decisions: Are you getting the best value for dollars spent? Student achievement, teacher quality, school safety, 21st century teaching and learning — these are but a glimpse into the areas of need each administrator must consider when making school spending decisions. Add to each of these spending decisions the impact of student productivity, and your efficiency and financial anxiety might increase. As the 2014-2015 school year heads into full swing, are you left wondering how to spend your tight budget on the right things? A new Swedish study shows that adolescents who suffer from sleep disturbance or habitual short sleep duration are less likely to succeed academically compared to those who enjoy a good night's sleep. The results have recently been published in the journal Sleep Medicine. In a new study involving more than 20,000 adolescents aged between 12 and 19 from Uppsala County, researchers from Uppsala University demonstrate that reports of sleep disturbance and habitual short sleep duration (less than 7 hours per day) increased the risk of failure in school. A group of eighth-grade teachers sat down to review a student's data in preparation for an upcoming meeting. The student was reading at approximately a third-grade level. She struggled with determining the sounds and meaning of even basic words, and it was clear she could benefit from practice in phonics and fluency. For many, the word dyslexia represents painful struggles with reading and speech that impact their self-confidence — 20 percent of school-aged children and over 40 million adults in the U.S. are dyslexic. The PARCC testing consortium has announced that schools will need to schedule about 10 hours of testing time this spring for elementary school students, and nearly 11 hours or more for middle and high school students. Recently released, the new time projections are higher than the estimates that PARCC issued in March of 2013: eight to 10 hours of testing. But that's because the earlier figures reflected something different: the amount of time "typical" students would need to complete the English/language arts and mathematics tests. The idea that students need to develop a deeper understanding of content and the ability to apply what they learn in one area to another area are major premises of new learning standards, such as the Common Core State Standards and Next Generation Science Standards. A new study now shows that schools promoting the practices of what's called "deeper learning" are getting better results from their students. For example, those students are more likely to graduate on time, are more likely to attend four-year colleges and achieve higher test scores. "I know you're smarter than this." "Why aren't you trying?" "You just have to do this." This criticism stems from teachers and parents who pull their kids aside in the midst of another homework session. Frustration ensues between the child and the adult. The problem may not lie in the student's work ethic, it may not lie in the teacher's ability, nor the parent's guidance. No one is to blame because what the child may be experiencing is a brain-processing problem. Making sense of the reading, the letters or the sounds could pose a challenge for anyone who shows markers for dyslexia, a language-based disorder.